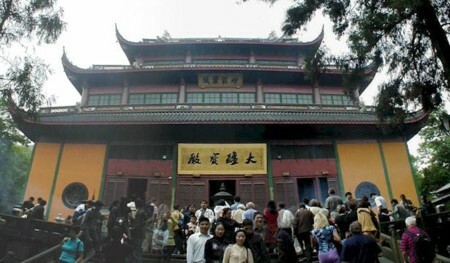 The Lingyin (Souls Retreat) Monastery is one of the best known Buddhist monasteries in China. It was built in 326 at the foot of Lingyin Mountain ( Hangzhou.) The main hall, 33.6 meters high, is one of China's tallest one-story buildings, further distinguished by double eaves. A statue of Sakyamuni, carved out of 24 pieces of camphor wood, stands 19.6 meters high in the main hall. In front of the hall are two stone pagodas built during the Five Dynasties (907-960).